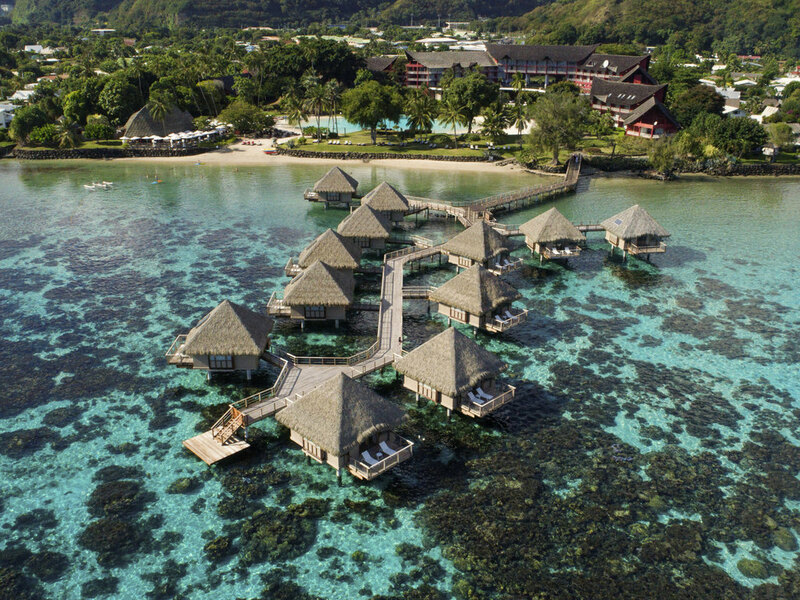 The Tahiti Ia Ora Beach Resort - Managed by Sofitel is located on the west coast, in the heart of tropical gardens, on the edge of the only white sand beach of the island, with a view over the sea, Moorea island and in the evenings, beautiful sunsets. You can relax in the sand-bottom pool. Free WiFi is available in public areas. It offers rooms with garden or lagoon view, overwater bungalows with a stunning view of Moorea island, 2 restaurants and 2 bars, a wellness center and meeting rooms. Tahiti's most unique dining concept offers fine and creative cuisine before beautiful ocean views. À la carte and a large selection of wines are served in an elegant décor, exotic furnishings and a captivating lounge. French culinary art combines with the flavors of Polynesia at La Plantation restaurant. Large buffets, intriguing menus and theme nights are available, as well as a fabulous Tahitian dance show every Friday night. Unwind with a cocktail at L'Astrolabe bar, the signature lounge with panoramic views of the tropical gardens.